LightSlinger Heroes is a twist on Match-3 gameplay – incorporating strategy, puzzles, and RPG elements. Shoot and match 3 or more bubbles to attack legendary monsters as you sling your way to the top – and join the quest to become the legendary LightSlinger! Carefully plan your moves to create ultimate combos and summon heroes to unleash deadly attacks. Assemble a powerful team of heroes as you complete each quest; each hero will grant you new combos and spells to use in battle. Form a guild by inviting your closest clanmates to embark on real-time raids or join the PvP Arena where you will go head to head with other teams. In LightSlinger Heroes, legendary creatures run rampant – destroying everything in their path. You’re tasked with choosing a faction – and then taking on difficult quests in order to kill each beast. Gameplay may seem simple on the surface, but actual strategy is required in order to beat the toughest enemies. At a cursory glance, the marriage of bubble shooter and RPG might seem like a match made in heaven – but in reality, it requires a bit of “marriage counselling” to work. In order to ensure strategic depth on every board, Skyborne added mechanics like “Wild Bubbles” – allowing players to shoot 3 bubbles for a turn – and “Combo Effects” such as Heal/Attack All when you match 5 of a colour. Bubble shooter + RPG: Think Puzzle & Dragons meets Panda Pop. Endless hero combos: One hero can set explosive bubble traps, while another can fire a piercing shot to trigger the traps. Real-time raid battles: Work with your guildmates to take down bosses in real-time or steal the last hit from your rivals! 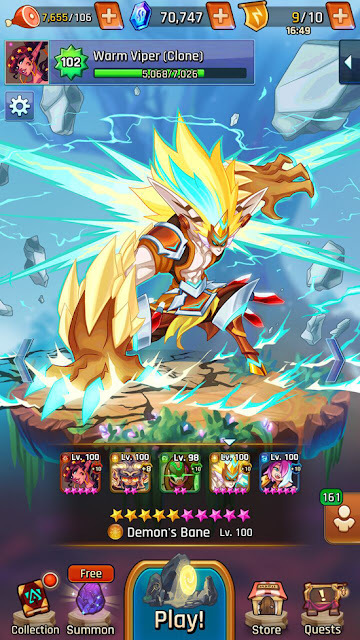 PvP arena: Battle other players’ teams to become the top player. Guilds: Invite your friends, and play together to unlock guild chests – then strategize to take down mammoth guild bosses. Endless Surprise: Participate in 3 different event quests – tactical challenge dungeons, procedural puzzle adventures, and co-op MMO-style guild raids. LightSlinger Heroes will be available on iOS and Android on Wednesday, April 25 as a free-to-play title. A VIP Program will be available for $9.99 a month that grants players a set of free rewards and bonus deals.